Institute of Archeology of the National Academy of Sciences of Ukraine (Інститут археології Національної академії наук України; Instytut arkheolohii Natsionalnoi akademii nauk Ukrainy). A research institute established in 1938 in Kyiv as the Institute of Archeology of the Academy of Sciences of the Ukrainian SSR. Its forerunners include the Kyiv Archeological Institute (1917–24), the All-Ukrainian Archeological Committee (1923–34), and the Institute of the History of Material Culture of the Academy of Sciences of the Ukrainian SSR (1934–8). The institute co-ordinates all written and field research in archeology and ancient history in Ukraine. In 1970 a separate branch for the study of Kyiv’s archeology was created. By the early 1980s the institute had 12 departments and 4 sectors. Two preserve areas—Olbia (est 1952) near Parutyne, Ochakiv raion, Mykolaiv oblast, and the Kamiana Mohyla Nature Reserve (est 1954) near Terpinnia, Melitopol raion, Zaporizhia oblast—were maintained by the institute. The institute published specialized monographs and collections and several serials: Arkheolohiia (1st series, 24 vols, 1947–70; 2nd series, 60 vols, 1971–89), Arkheolohichni pam'iatky URSR (13 vols, 1949–63), Kratkie soobshcheniia Instituta arkheologii AN URSR (12 issues, 1952–62), and Arkheologicheskie issledovaniia na Ukraine (4 issues, 1967–72). In 1985 it had a staff of 130 scholars. In 1984 a history of the institute was published in Kyiv. In 2001 the institute assumed its present name. By 2010 it had a staff of 120 scholars, including one academician and two corresponding members of the National Academy of Sciences of Ukraine. Between 1987 and 2017 the institute was headed by the academician Petro Tolochko, a renowned expert in the archeology of Kyivan Rus’. Since 2017 it has been headed by Viktor Chabai, a specialist on the Stone Age archeology in the Crimea. As of 2017 the institute consists of the following departments: the Stone Age archeology; the Copper Age and the Bronze Age archeology; the Scythian and Sarmatian archeology; the ancient or classical archeology; the archeology of early Slavs; the archeology of Kyivan Rus’ and the Middle Ages; the archeology of Kyiv; the archeology of the northwestern Black Sea region (see Ancient states on the northern Black Sea shore); bioarcheology; field research and exhibitions; and archeological museum. The institute continues to supervise a historical preserve Olbia in Ochakiv raion, Mykolaiv oblast—a site of a Hellenic city-state. Until the Russian occupation of the Crimea in 2014 the institute also operated a local Crimean branch that specialized in various periods of local history ranging from the Stone Age and Bronze Age to Scythian and Sarmatian archeology to Greco-Roman and Genoese settlements. Since the late 1980s the leading scholars of the institute have studied a wide range of topics, such as the Stone Age in Ukraine (Leonid Zalizniak, Serhii Ryzhov, Oleksandra Krotova), Trypilian culture and Pit-Grave culture (Oleksii Korvin-Piotrovsky, Dmytro Telehin, Natalia Burdo, Yurii Rassamakin), Scythian and Sarmatian artefacts (Viacheslav Murzin, Serhii Skory), Greco-Roman ancient states on the northern Black Sea shore and the Crimea (Serhii Kryzhytsky, Anna Rusiaieva, Vitalii Zubar), early Slavs (Volodymyr Baran, Liubov Skyba, Denys Kozak, Rostyslav Terpylovsky), and Kyivan Rus’ and medieval Ukraine (Mykhailo Braichevsky, Petro Tolochko, Hlib Ivakin, Oleksandr Motsia, Serhii Vysotsky, Mykhailo Sahaidak, Volodymyr Zotsenko, Heorhii Kozubovsky). Among the institute’s most notable publications that appeared after 1991 are: Petro Tolochko, Drevniaia Rus’ (Old Rus’, 1992); Mykhailo Braichevsky, Konspekt istoriї Ukraїny (A Sketch of the History of Ukraine, 1993); Oleksandr Motsia, Naselennia pivdenno-rus’kykh zemel’ IX–XIII st. (za materialamy nekropoliv) (The Population of Southern Rus’ Lands in the 9th–12th Centuries According to the Necropolises, 1993); Hlib Ivakin, Istorychnyi rozvytok Kyieva XIII–seredyny XVI st. (istoryko-topohrafichni narysy) (A Historical Development of Kyiv in the 13th–the middle of the 16th Centuries: Historical and Topographical Essays, 1996); Leonid Zalizniak, Peredistoriia Ukraїny, X–V tys. do n. e. (A Prehistory of Ukraine, 10th–5th Millennia B.C., 1998); and a few collective monographs, among them Slavianie Iugo-Vostochnoi Evropy (The Slavs of South-Eastern Europe, 1991); Davnia istoriia Ukraїny (The Old History of Ukraine, 3 vols, 1997–2000); Etnichna istoriia davnioї Ukraїny (The Ethnic History of Old Ukraine, 2002); I. Vinokur and D. Telehin, Arkheolohiia Ukraїny (The Archeology of Ukraine, 2008); and Cherniakhivs’ka kul’tura (Cherniakhiv Culture, 2016). 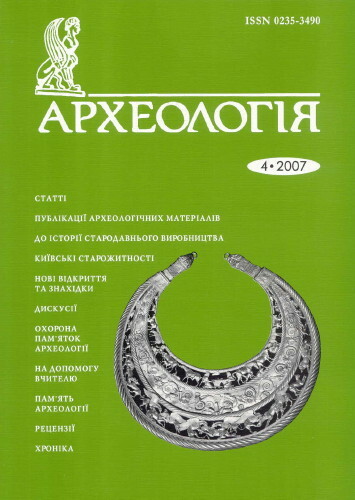 The institute’s main periodical is Arkheolohiia (a new quarterly series established in 1989), a successor to the previous publications under the same name. More recent periodicals include Arkheolohiia і davnia istoriia Ukraїny (2009–, 21 volumes to date) and the yearbook Kam’iana doba Ukraїny (2002–16, 16 volumes, since 2017 a quarterly).